A former close ally of the US in Iraq, Ahmed Chalabi, has denounced the US authorities in Baghdad after a raid on his residence and party offices. 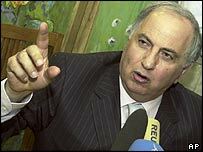 Troops surrounded Mr Chalabi's home and offices in the Mansour district and removed computers and documents. Mr Chalabi - a prominent member of the US-appointed Governing Council - said it was an attempt to discredit him. He has become increasingly distanced from Washington after questioning how much power it was ceding to Iraqis. "I am America's best friend in Iraq; if the CPA (Coalition Provisional Authority) finds it necessary to direct an armed attack against my home you can see the state of relations between the CPA and the Iraqi people," he told reporters after the raid. Brandishing a shattered framed picture, he said troops and police had roused him from his bed, ransacked his office, removed documents and a valuable copy of the Koran, and damaged his belongings. US officials have not fully explained what they were looking for and Mr Chalabi said they had found nothing incriminating. Coalition spokesman Dan Senor said: "It was an Iraqi-led raid as a result of Iraqi warrants." Mr Senor said US administrator in Iraq Paul Bremer was told about the raid "after the fact". The US Defence Secretary, Donald Rumsfeld, also said Iraqis were responsible for the raid and he had not been informed. But Mr Chalabi told the BBC that such an operation could not have been launched without the full approval of the US authorities in Iraq. He said the Americans felt challenged by his influence, given his demands that full, not partial, sovereignty be handed over to the Iraqi people - along with total control of the nation's assets. "I am a friend of the United States," he told the World Service's Newshour. "But I challenge the CPA because they are moving against Iraqi interests and against American interests in trying to impose something that is not workable in Iraq." Last year, Mr Chalabi was one of the first Iraqi exiles to be flown back into Iraq following the US-led invasion. He was seen by Pentagon officials as a possible future president. But he has struggled to gain popular support and recently criticised Washington's handling of the volatile situation in Iraq. 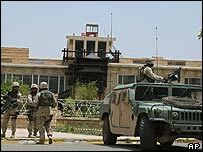 In the run-up to the conflict his political party, the Iraqi National Congress (INC), is believed to have been instrumental in providing some of the intelligence used by the Bush administration to support its case for war. Many, including American officials, now question the validity of that intelligence. But Mr Chalabi denied that the US no longer trusted him, and felt it had been misled over weapons of mass destruction and the Iraq war. It was the Americans' fault - not his - that they had found no such weapons, he said. The INC has received millions of dollars from the US since its foundation in the 1990s. But US officials said on Tuesday the Pentagon had cut off some $340,000 a month in funding to the party - payments that were made in part for intelligence gathered by the INC.
Deputy Defence Secretary Paul Wolfowitz said the decision "was made in light of the process of transferring sovereignty to the Iraqi people". "Chalabi was initially seen as a post-Saddam ruler of Iraq"